Brunch N' Cupcakes: If I had the day off.. If I had the day off..
Hello Monday, I can't believe I get to see you again so soon! If I had today off I could think of a million things I would have done today like... Sleep in, make pancakes for breakfast, baked... maybe I would have even treated myself to a mani and pedi! The list could go on and on! A three day weekend would have been glorious! Any of you enjoying a lovely three day weekend? Alas I am at work, so I need to make the best of it! But on the bright side I do have a great line up of recipes for you this week. Recipes that I am really excited about! Shall we take a look at them? I think we shall! Two of these recipes I made this weekend, but I am going to include them in our list this morning! Since the weather in Minnesota was beautiful (think sunny and 40's this is wonderful for MN) my family grilled all weekend! Grilling makes me excited for spring even more then I already am! Alright winter you can end already! Lets begin with a delicious side dish that was served along grilled scallops (and steak for my dad). 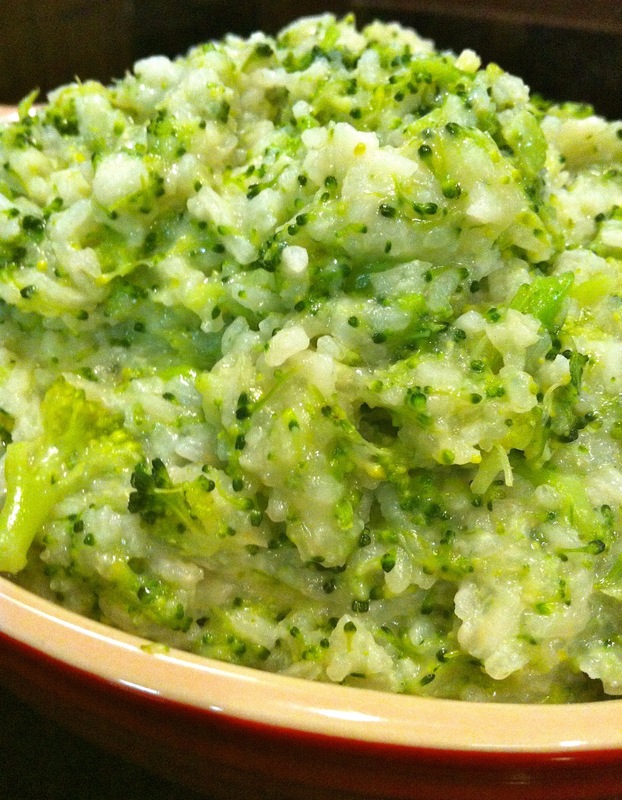 A healthy version of Cheesy Broccoli rice! Brought to you by Better Homes and Garden. I actually cooked the rice in chicken broth instead of water and added a bit of garlic! I was happy with the added flavor! Fresh steamed broccoli was also used. Healthy comfort food is always a winner in my book! 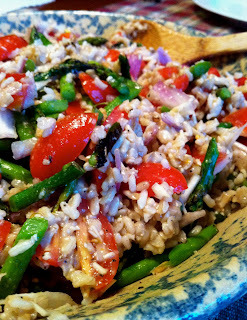 Sunday I prepared this wonderful Italian Rice Salad from Cooking Light! Served along side grilled Tomato Basil Chicken (live near a HyVee? go pick that chicken up)!! I used grilled asparagus in place of the green beans. The smoky grilled flavor from the asparagus added a great flavor dimension. This recipe makes a large batch of salad, perfect to pack for lunch! Oh but wait there is more! There are three more recipes in the line up this week! I did the prep work for these Skinny Taste Spinach Lasagna Rolls Yesterday! They looked wonderful, and I cannot wait to eat them tonight! I have had a serious lasagna craving the last few weeks! Stay tuned for the results! Happy Monday! And if you have an added day to your weekend enjoy it! PS check out my guest post from Saturday over at Foodie Fiasco! Kelly has a fabulous blog, I just love it! Oh I've been wanting to try those lasagna roll ups!! Enchiladas look to die for too. Great menu! Aww, those pictures just made me drool :) So inspiring! I have wanted to make the lasagna rolls for a while! It looks incredible! I am off today .... Love 3 day wknds! Can't wait to hear about the lasagna rolls! I have been dying to make those! I was just looking at those lasagna roll-ups last night! look so yummy, as does the cheesy broccoli rice! And thank you so much for the guest post! wow! everything looks SO good! I'm loving that salad! I just saved the link for the lasagna rolls! can't wait to try! I had to work today too, right there with ya girl! My mom made lasagna roll ups that look very similar to those I will have to see if those are the ones she made! They were delish!